Cholesterol removal by isolated Lactococcus lactis subsp. lactis was investigated in vitro. The studied mechanisms were (1) assimilation of cholesterol by growing bacterial cells, (2) deconjugation of bile salts by bile salt hydrolase, (3) precipitation of cholesterol with deconjugated bile, (4) binding of cholesterol to the cell membrane, and (5) incorporation of cholesterol into the cell membrane. Levels of cholesterol assimilated by growing cells (43.70%) were significantly higher than those assimilated by resting cells (12.93%) or counterpart dead cells (6.35%). Scanning electron micrographs indicated that cholesterol adsorbed to the bacterial cell wall. A comparison of IR spectra of Lactococcus lactis subsp. 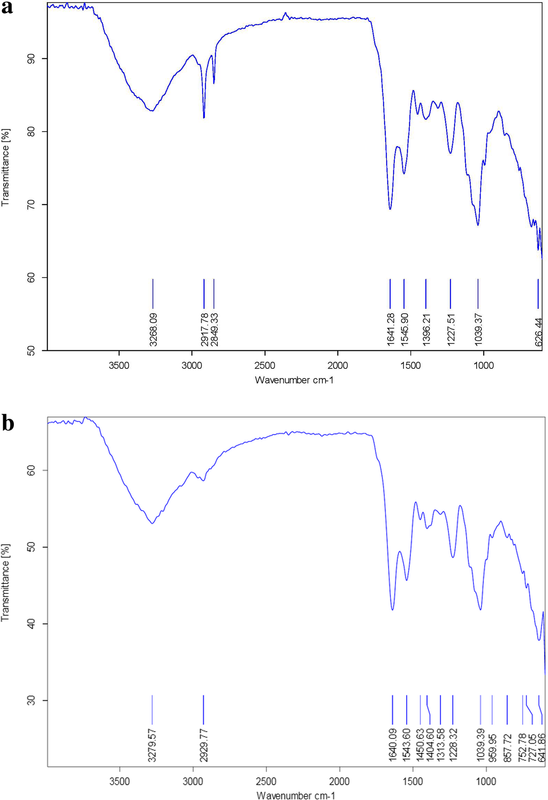 lactis grown with and without cholesterol using an FTIR spectroscopy database revealed intensity changes associated with sulfamide bonds, P–H stretching and the C≡C bonds. Precipitation of cholesterol upon deconjugation of glycocholate was higher (5.53 μg/ml) than that observed upon taurocholate (3.7 μg/ml). The present study suggested the ability of probiotic Lactococcus lactis subsp. lactis to reduce its cholesterol level through several different mechanisms. Consequently, this probiotic bacterium showed an interested potential of application in cholesterol reduction to be a novel and save prospect in resolving hypocholesteremia and related diseases. Probiotic microorganisms can stimulate gut microbiota to modify the gastrointestinal environment, which gives health benefits to the host (Fuller 1989). Many early reports showed that administration of probiotics, especially Lactobacillus and Lactococcus, alleviates or prevents intestinal disorders, such as lactose intolerance and diarrhea (Gilliland 1990). Other benefits of probiotics include lowering the total plasma cholesterol and low-density lipoprotein (LDL) levels (Anderson and Gilliland 1999; Sanders 2000). There have been numerous studies on the ability of probiotics to remove cholesterol and their hypocholesterolemic effects (Patel et al. 2010). In particular, bile salt hydrolase (BSH) is an enzyme produced by several bacterial species in human or animal gastrointestinal tracts that catalyzes the deconjugation of glycine or taurine from conjugated bile salts. Microbe BSH activity contributes to the probiotic properties of those microbes in the gastrointestinal tract5. Recently, several studies have been published on the distribution and activity of BSH in more than 300 lactic acid bacteria strains from the genera Bifidobacterium and Lactobacillus, and the species Lactococcus lactis, Leuconostoc mesenteroides, and Streptococcus thermophilus (González-Vázquez et al. 2015; Xu et al. 2016; Rani et al. 2017). Lactobacillus spp. from the stationary phase of static cultures had high BSH activities at low pH values (González-Vázquez et al. 2015; Sedláčková et al. 2015). It has been reported that changes in the bacterial cellular lipid composition are attributed to changes in the composition of the fermentation medium (Brashears et al. 1998). The fatty acid composition of the bacterial cells was altered as a result of cholesterol being incorporated into the cell membrane after its removal from the medium (Johnson et al. 1995; Kimoto et al. 2002). The present study was aimed at examining the cholesterol-lowering activity of Lactococcus lactis subsp. lactis strains. Lactococcus lactis subsp. lactis—a probiotic strain—was used in this study (accession number MG847590). It was isolated from boza (a traditional cereal-based fermented drink in Egypt) and selected as a probiotic in our previous study (Shehata et al. 2016). Stock cultures of Lactococcus lactis subsp. lactis were stored in 40% glycerol at − 80 °C. The strain was subcultured three times before use in sterile De Man, Rogosa, and Sharpe (MRS) broth using a 1% inoculum and a 20-h incubation period at 30 °C. Cholesterol uptake was determined according to the modified method of Kimoto et al., (2004). An overnight culture was inoculated into MRS broth (10 ml) and incubated at 42 °C for 19 h. After incubation, the cells were harvested by centrifugation (1800×g, 15 min), washed twice with sterile distilled water, and resuspended in distilled water (10 ml). The suspension was divided into two portions. The first portion was autoclaved for 15 min at 121 °C to prepare heat-killed cells. These cells were suspended in MRS broth containing ox gall (3 mg/ml) and cholesterol (100 μg/ml), which was previously adjusted to pH 6.8. In the case of the resting cells, they were suspended with phosphate-buffered saline (50 mM, pH 6.8) containing ox gall (3 mg/ml) and cholesterol (100 μg/ml). After the incubation period, the cells were removed by centrifugation (9000×g, 15 min), and the remaining cholesterol in the spent broth was determined colorimetrically using the o-phthalaldehyde method described by Rudel and Morris (1973). The growth pattern and cholesterol assimilation were studied as described by Liong and Shah (2005a). An overnight culture of L. lactis subsp. lactis was inoculated (1% v/v) into freshly prepared MRS broth, which was supplemented with 0.3% ox gall as a source of bile salts and polyoxyethanyl–cholesteryl sebacate (water-soluble cholesterol, Sigma) in filter-sterilized water (final concentration 100 μg/ml) and incubated at 30 °C for 24 h. Samples were taken at 3-h intervals within a period of 24 h. The growth was followed by measuring the absorbance at 620 nm. After the incubation period, the cells were harvested by centrifugation (9000×g, 15 min), and the remaining cholesterol concentration in the broth was determined using a modified colorimetric method as described by Rudel and Morris (1973). Lactococcus lactis subsp. lactis was cultured in MRS broth with (100 mg/l) and without cholesterol, and samples were prepared for electron microscopy according to the procedure of Hassanein et al. (2013). The cells were fixed in 3% glutaraldehyde, dehydrated (50% to absolute alcohol), embedded in epoxy resin, polymerized in an oven at 60 °C for 48 h, and finally stained with 0.5% uranyl acetate followed by 0.4% lead acetate. Sections were examined and imaged using a scanning electron microscope (Hitachi, HT7800 Series). Lactococcus lactis subsp. lactis was cultured in MRS broth with and without cholesterol for 20 h at 30 °C. Then, the cells were harvested by centrifugation (9000×g, 15 min), washed (phosphate-buffered saline, 50 mM, pH 6.8) and prepared for FTIR analysis according to Kleiner et al. (2002). Spectra were scanned over spatial frequencies between 400 and 4000 cm−1 with a resolution of 4 cm−1. The results are expressed as the percentage absorbance at a specific wavenumber. The functional groups were identified by comparing the wavenumbers of the spectral peaks to known standards in the database program for FTIR spectroscopy. Cellular lipids were extracted using a modified method of Murga et al. (2000). Lactococcus lactis subsp. lactis was inoculated (1% v/v) into MRS broth with and without cholesterol and incubated at 30 °C for 24 h. After incubation, the cells were harvested by centrifugation (9000×g, 15 min). The cell pellet was mixed with methanol/chloroform (2:1 v/v, 1 ml) and vortexed at room temperature for 2 min. Aliquots were left to stand for 24 h at 4 °C and then centrifuged (10,000×g, 4 °C, 10 min). The supernatant was collected, and the cell pellet was washed twice with methanol/chloroform/distilled water (2:1:0.8 v/v, 1 ml). All three supernatants were pooled and vortexed for 1 min. Then, distilled water (1 ml) and chloroform (1 ml) were added, followed by vortexing for 2 min. The mixture was allowed to separate, and the chloroform layer (bottom) was collected and evaporated. The lipid residue was dissolved in hexane (0.5 ml) and converted into fatty acid methyl esters with the addition of methanolic KOH (2M, 100 μl). Hydrochloric acid (2M) was added until the methyl orange indicator changed to pink, and the mixture was allowed to settle. The organic layer (10 μl) was collected and injected into a gas chromatograph equipped with a flame ionization detector. A stainless-steel column (30 m × 0.25 mm) packed with 70% cyanopropyl polysilphenylene-siloxane was used. The oven temperature was adjusted to 100 °C after sample injection and increased to 225 °C at a rate of 5 °C/min. The injector and detector temperatures were 260 and 280 °C, respectively. Helium was used as the carrier gas (3 ml/min), with a split ratio of 1:100 and an injection volume of 1 μl. The concentration of fatty acid methyl esters in the samples was determined using fatty acid standards (Sigma Chemical Co., St. Louis, MO, USA). All experiments were repeated twice. The BSH activity was determined by measuring the number of amino acids liberated from conjugated bile salts by the probiotic isolate as described by Tanaka et al. (2000) with several modifications. In brief, from cultures grown for 20 h at 30 °C, cells were harvested by centrifugation (9700×g, 15 min), washed twice with sodium phosphate buffer (100 mM, pH 6.8) containing dithiothreitol (10 mM), and resuspended in the same buffer to obtain a suspension with an optical absorbance (A600 nm) of 3.0. The cell suspension was sonicated for 60 s with cooling on ice for two cycles using an ultrasonic processor (Vibra-Cell, Sonics and Materials Inc., 16-mm probe), followed by centrifugation (9700×g, 15 min). The reaction mixture consisted of sodium phosphate buffer (100 mM, pH 6.0, 180 μl), the conjugated bile salt (200 mM, 10 μl), dithiothreitol (10 mM), and cell-free extract (10 μl). The reaction mixture was incubated at 37 °C for 30 min. Then, a sample (100 μl) was taken, and 15% (w/v) trichloroacetic acid (200 μl) was added to terminate the reaction. The sample was centrifuged (9700×g, 15 min), and supernatant (200 μl) was added to distilled water (200 μl) and ninhydrin solution [ninhydrin (5 mg), glycerol (1.2 ml), and sodium citrate buffer (500 mM, pH 5.5, 0.7 ml), 1.9 ml]. The mixture was vortexed and boiled for 14 min. After cooling, the absorbance at 570 nm was measured using glycine or taurine as a standard. One unit of BSH activity (U/ml) was defined as the amount of enzyme that liberated 1 mmol of amino acid from the substrate per min. The protein concentration was determined by the Lowry method (Lowry et al. 1951), with bovine serum albumin (Sigma) as a standard. All experiments were repeated twice. Ten-milliliter volumes of MRS–LC broth were supplemented with sodium glycocholate (6 mM), sodium taurocholate (6 mM), or a mixture of sodium glycocholate (2.8 mM) and sodium taurocholate (1.2 mM). Then, the broth was inoculated with 1% L. lactis subsp. lactis and incubated at 30 °C for 20 h. Quantification of bile salt deconjugation was based on the release of the deconjugated cholic acid, which was measured by using the method of Irvin et al. (1944) with modifications. In brief, the pH of incubated culture (10 ml) was adjusted to 7.0 with NaOH (1N). Cells were then centrifuged (10,000×g, 4 °C, 10 min). The pH of the resultant supernatant was adjusted to 1.0 with HCl (10N). One milliliter of the supernatant (1 ml) was added to ethyl acetate (2 ml), and the mixture was vortexed for 1 min. Two milliliters of the ethyl acetate layer was transferred into a glass tube and evaporated at 60 °C. The residue was immediately dissolved in NaOH (0.01N, 1 ml). After complete mixing, 1% furfuraldehyde (1 ml) and H2SO4 (16 N, 1 ml) were added, and the mixture was vortexed for 1 min before heating at 65 °C in a water bath for 10 min. After cooling, glacial acetic acid (2 ml) was added, and the mixture was vortexed for 1 min. The absorbance at 660 nm was measured. The amount of cholic acid released was determined using the standard curve of the gradient concentrations of cholic acid (Sigma). All experiments were repeated twice. Freshly prepared sterile MRS–LC broth (10 ml) was supplemented with sodium glycocholate (6 mM), sodium taurocholate (6 mM), or a mixture of sodium glycocholate (2.8 mM) and sodium taurocholate (1.2 mM). Water-soluble cholesterol was filter sterilized and added to the broth at a final concentration of 100 μg/ml. Then, the mixture inoculated with 1% L. lactis subsp. lactis and incubated at 30 °C for 20 h. After the incubation period, the cells were centrifuged (9000×g, 15 min), and the cholesterol concentration in the broth was determined using a colorimetric method as described by Rudel and Morris (1973). Co-precipitation of cholesterol with bile acids was determined over a pH range of 1.0 to 7.0 using sodium acetate buffer (0.1 M, pH 1.0–5.0) and sodium phosphate buffer (0.1 M, pH 6.0–7.0 (Liong and Shah 2005a). Cholic acid (10 mM) was used as the deconjugated bile acid, and sodium glycocholate (5 mM) and sodium taurocholate (5 mM) were used as conjugated bile salts. The pH of the MRS–LC media was adjusted to the test values using HCl (1 M), and filter-sterilized cholesterol (100 μg/ml) was added aseptically. The media were inoculated with L. lactis subsp. lactis and incubated at 30 °C for 20 h. After the incubation period, the media were centrifuged (9000×g, 15 min), and the cholesterol concentration in the supernatants was determined using a colorimetric method as described by Rudel and Morris (1973). Data were statistically analyzed with CoStat software (version 6.303). One-way analysis of variance was used to study the significant difference among the means, at a significance level of p = 0.05. Growing Lactococcus lactis subsp. lactis cells exhibited good cholesterol-removal ability (Fig. 1) and reached their maximum (43.7%) in the late exponential growth phase (after 21 h). The non-growing (resting) (12.93%) and dead cells (6.35%) of Lactococcus lactis subsp. lactis could also remove cholesterol from the medium. These results emphasized that the cell membranes of resting and dead probiotic cells retain the ability to bind cholesterol. Scanning electron microscopy (SEM) examination was carried out to confirm the understanding of the cholesterol-binding activity of Lactococcus lactis subsp. lactis. It was clear that the cholesterol is absorbed on the surface of the bacterial cells beside bright zones observed around the cells cultured with cholesterol, as well as shown in (Fig. 2b), cells cultured without cholesterol tended to be duller (Fig. 2a). The differences between the bacterial cells with and without cholesterol in Fig. 2a, b might be due to the assimilation and adsorption of cholesterol on the surface of the cells resulting in the cholesterol removal from the media. It was in line with the spectrophotometric results which confirmed the decreasing of the concentration of cholesterol in the media by (43.7%). FTIR spectra were measured to determine the functional groups involved in the binding of cholesterol to the bacterial cell wall. FTIR spectra showed peaks between 600 and 4000 cm−1 (Fig. 3 and Tables 1 and 2), that we assigned to the stretching vibrations of hydroxy (O–H) and N–H groups at 3279.57 cm−1, C–H group at 2929.77 cm−1, P–H group at 1640.09 cm−1, C≡C group at 1543.60 cm−1, ester group (COOR) at 1404.60 cm−1, C=O bonded to amide I at 1228.32 cm−1, (N–H) bonded to amide II at 1039.39 cm− 1 and S=O sulfamide bonds at 641.86 cm−1 for untreated Lactococcus lactis subsp. lactis cells. The wavelength peaks of Lactococcus lactis subsp. lactis treated with cholesterol were assigned to the stretching vibration of the O–H and N–H groups at 3268.09 cm−1, C–H group at 2917.78 cm−1, CH2 and CH3 symmetric stretching at 2849.33 cm−1, P–H group at 1641.28 cm−1, C≡C groups at 1545.90 cm−1, ester group (COOR) at 1396.21 cm−1, C=O bonded to amide I at 1227.51 cm−1, N–H bonded to amide II at 1039.37 cm−1, and S=O sulfamide bonds at 626.44 cm−1. Regarding the FTIR spectra of cells grown with cholesterol (Table 1 and Fig. 3a), the most obvious changes in intensity were detected for the sulfamide bonds, P–H stretching, and the C≡C bonds for which the intensity was 68%, 65%, and 62% higher, respectively, than in the control cells. The wavenumbers of the peaks (numbered in Fig. 3) for the control and cholesterol-treated cells are the same, except for peaks 2 and 3, which are due to the affinity between the cholesterol and the bacterium, indicating the cholesterol-binding activity of Lactococcus lactis subsp. lactis. The cellular fatty acid composition of Lactococcus lactis subsp. lactis cultured in the presence and absence of cholesterol was quantified and the differences between the two groups are apparent from the data in Table 3. Alterations of the fatty acid profile were found especially for palmitic acid, stearic acid, and total saturated fatty acids (SFA) and unsaturated fatty acids (UFA). Cells cultured in media without cholesterol showed high levels of palmitic and stearic acids. The cells grown in the presence of cholesterol contained more oleic and linoleic acids compared to cells cultured in the medium without cholesterol. Lactococcus lactis subsp. lactis cultured with and without cholesterol also exhibited a higher level of total UFA than total SFA. The total level of UFA of cells grown in the presence of cholesterol was higher than that of the cells grown in the absence of cholesterol. The deconjugation activity of the isolated Lactococcus lactis subsp. lactis toward sodium glycocholate, sodium taurocholate, and their mixture, as determined by the amount of cholic acid released, is shown in Table 4. In the present study, although the deconjugation activities among substrates were not statistically different, Lactococcus lactis subsp. lactis showed a preference toward the deconjugation of sodium glycocholate (1.39 mM) compared to sodium taurocholate (0.74 mM). 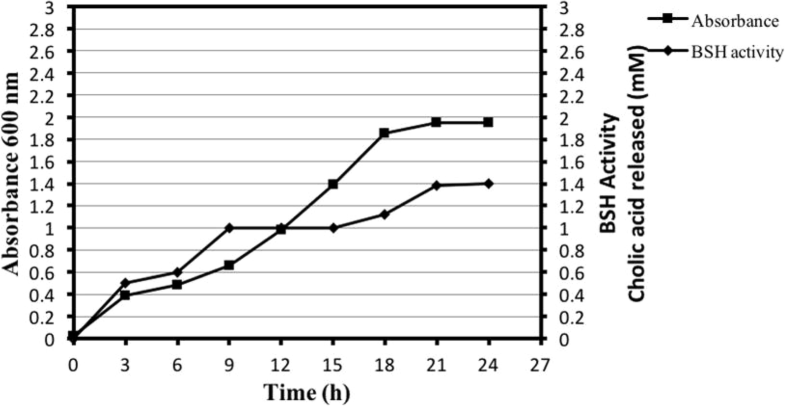 It showed the highest (1.46 mM) deconjugation activity on the mixture at concentrations that resemble those of sodium glycocholate (2.8 mM) and sodium taurocholate (1.2 mM) in human bile (Table 4). In this sense, bile salt deconjugation is a desirable property when selecting a strain of probiotic to be used as a dietary adjunct. According to the results obtained in the present study, Lactococcus lactis subsp. lactis is a promising isolate that exhibited high BSH activity (2.47 U/ml) using sodium taurocholate. When Lactococcus lactis subsp. 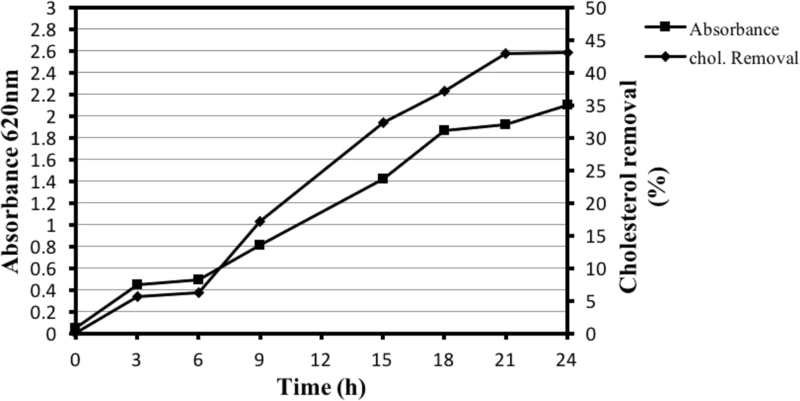 lactis was grown for 24 h in MRS broth supplemented with a mixture of sodium glycocholate (6 mM) and sodium taurocholate (6 mM), it exhibited the highest BSH activity by the end of the log growth phase (Fig. 4). Precipitation of cholesterol upon deconjugation of sodium glycocholate was 5.53 μg/ml, while upon deconjugation of sodium taurocholate 3.7 μg/ml (Table 5). When the mixture of sodium glycocholate and sodium taurocholate was used at concentrations of 1.4 mM, the precipitation of cholesterol was lower compared to the individual deconjugation of sodium glycocholate (5.2 μg/ml). The precipitation of cholesterol with cholic acid (as an unconjugated bile) and glycocholate or taurocholate (as a conjugated bile) was investigated at various pH values, and the results were shown in Fig. 5. The amount of precipitated cholesterol increased with the decrease of pH in all cases. More precipitation occurs below pH 4.0. The highest level of precipitation was observed with cholic acid, followed by sodium glycocholate, and the lowest level of precipitation was observed for sodium taurocholate. Precipitation of cholesterol with cholic acid increased rapidly with decreasing pH levels below 4.0, with a maximum precipitation of 4 μg/ml, which was obtained at pH 1.0. The lowest amount of cholesterol precipitated with sodium glycocholate (0.8–1.5 μg/ml) was observed below pH 4.0. Whereas precipitation of cholesterol with sodium taurocholate was minimal (0.4–0.5 μg/ml), and the highest precipitation was obtained at pH 1–2. Cholesterol removal was closely associated with bacterial growth. Pereira and Gibson (2002) reported that Lactobacillus fermentum reduced cholesterol through assimilation in vitro. It was reported that the assimilation of cholesterol by cells growing in the gut could reduce the amount of cholesterol available for absorption by the intestine (Pigeon et al. 2002; Miremadi et al. 2014). The promised isolate Lactococcus lactis subsp. lactis actively takes up cholesterol from the growth media and would function in vivo with a hypocholesterolemic effect (data not show). The non-growing (resting) and dead cells of Lactococcus lactis subsp. Accordingly, it has been assumed that even nonviable cells of probiotics could be used as cholesterol reducing agents (Tok and Aslim 2010). It has been noted previously that resting and dead cells of Lactobacillus species are able to remove cholesterol in vitro (Kimoto et al. 2002; Liong and Shah 2005a; Miremadi et al. 2014). It is implied that cholesterol removal is achieved not only through the mechanism of assimilation by growing probiotic cells but also by adhesion to cell membranes. Cholesterol assimilation by growing cells (43.7%) was significantly higher than that by resting cells (12.93%) and dead cells (6.35%). Both live and heat-killed Lactococcus lactis subsp. lactis N7 cells were able to remove cholesterol from growth media. However, the amount of cholesterol removed by live cells was significantly higher than that removed by dead cells (Kimoto et al. 2007). Scanning electron microscopy examination was carried out to confirm the understanding of the cholesterol-binding activity of Lactococcus lactis subsp. lactis. The bright zone around the cells might indicate the secretion of exopolysaccharides, which has been suggested to have a role in cholesterol binding, as reported by Tahri et al. (1995), who stated that some probiotics could produce exopolysaccharides that adhere to the cell surface and could absorb cholesterol. FTIR spectra were measured to determine the functional groups involved in the binding of cholesterol to the bacterial cell wall. Usman and Hosono (1999) reported that the differences between the functional groups and their hypocholesterolemic effect are related to the mechanism of cholesterol binding to the bacterial cell walls, which varies among bacterial species. The binding differences of the different bacterial species might be due to the chemical and structural properties of their cell wall peptidoglycans, and therefore, even dead bacterial cells in the intestine might have the ability to bind cholesterol. We postulate that the increased fatty acid content was attributed to cholesterol incorporation into the membrane. Additionally, Hassanein et al. (2013) reported that the total SFA and UFA of the cells grown without cholesterol were 51.18% and 43.82%, respectively. These percentages were found to be 53.20% and 60.87%, respectively, if cholesterol were added to the growth medium. Taranto et al. (2003), as well as Liong and Shah (2005c), observed the increasing of UFAs level in the fatty acid profiles of L. reuteri, L. casei, and L. acidophilus grown in the presence of cholesterol. Kimoto et al. (2007) concluded that there was a difference in the fatty acid distribution for Lactococcus lactis subsp. lactis cells grown with or without cholesterol, suggesting that the balance of unsaturated to saturated fatty of the cells was altered as a result of the cholesterol being incorporated into the cell membrane after its removal from the media. These findings suggest that changes in the fatty acid composition of Lactococcus lactis subsp. lactis cells, which accompanied the reduction of the medium cholesterol content, indicated the incorporation of the cholesterol into the bacterial cell membrane. As a result of the deconjugation of bile salts, cholesterol micelle formation would be disturbed, and cholesterol absorption would be reduced (Miremadi et al. 2014). In agreement with the results of the present work, Liong and Shah (2005a) reported that Lactobacilli strains exhibited the highest deconjugation capability and BSH activity in experiments using concentrations of sodium glycocholate and sodium taurocholate that resemble the human bile and pH levels similar to that of the human intestine. Based on the preference of Lactococcus lactis subsp. lactis to deconjugate sodium glycocholate, the principal bile salt in the human intestine, it might be expected to be more efficient in lowering cholesterol. Moreover, its highest deconjugation activity was toward the mixture of sodium glycocholate and sodium taurocholate at concentrations resembling those in human bile might suggest its ability to exert strong in vivo deconjugation effects. Similar results were reported by Liong and Shah (2005b, c) for Bifidobacterium and Lactobacillus strains, respectively. These results emphasize that Lactococcus lactis subsp. lactis is promising in hypocholesterolemic food supplement and could reduce up to approximately 5.53% of the medium cholesterol content through the co-precipitation mechanism. The obtained results confirmed the findings of Liong and Shah (2005b, c) on the Bifidobacterium and Lactobacillus strains, respectively. Dashkevics and Feighner (1989) found that cholesterol precipitation by Lactobacillus was the highest with cholic acid below pH 4.0, whereas minimal precipitation occurred with sodium glycocholate below pH 4.0, and precipitation with taurocholate was negligible even at pH 1.0. They reported that at decreasing pH levels, taurine-conjugated bile salts remained ionized in solution, glycine-conjugated bile salts will be partially precipitated without hydrolysis, and conjugated bile salts will be protonated and precipitated. Because bile salt hydrolase (BSH) has an isoelectric point between 4.4 and 4.6 (Kim et al. 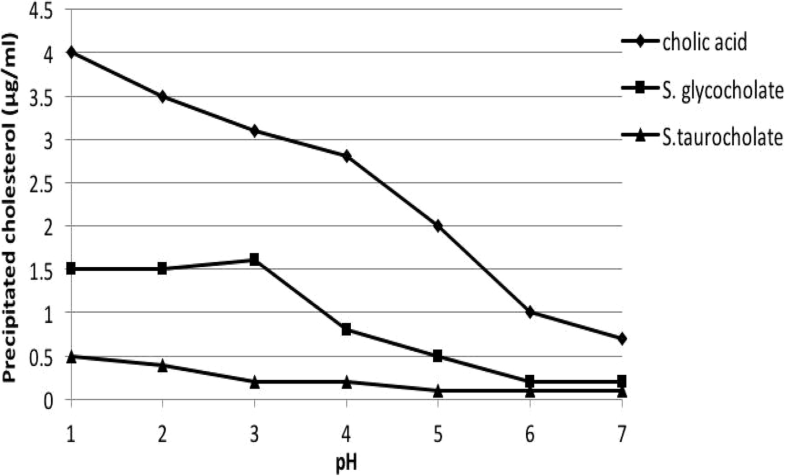 2004) and the pH of the intestine is unlikely to be lower than 6.0 (Brashears et al. 1998), we postulate that the precipitation of cholesterol with taurocholate would not be a major factor in controlling serum cholesterol. Based on our results, we hypothesize that Lactococcus lactis subsp. lactis removes cholesterol through all the examined mechanisms—that is, the assimilation of cholesterol by growing cells, deconjugation of bile by BSH catalysis, precipitation of cholesterol with deconjugated bile salts, binding of cholesterol to the bacterial cell membrane, and incorporation of cholesterol into the cell membrane. The assimilation of cholesterol by growing probiotic cells was significantly higher than that by resting and dead cells. Nevertheless, the observation of cholesterol removal by resting and dead cells confirmed that even nonviable probiotics retained the ability to bind cholesterol and could therefore be used as cholesterol-lowering agents in the gastrointestinal system. TEM images and a slight shift in the IR signals corresponding to the binding of functional groups on the cell surface indicated cholesterol-binding activity for the tested Lactococcus lactis subsp. lactis. Alteration of the balance of saturated to unsaturated fatty acids by lowering the cholesterol level of the medium indicated the incorporation of cholesterol into the cell membrane. These results are suggested that Lactococcus lactis subsp. lactis is a promising probiotic functional component for lowering serum cholesterol levels. These findings and suggested cholesterol-lowering mechanisms in this work might be opening a novel trend in dealing with hypercholesterolemia and related diseases. 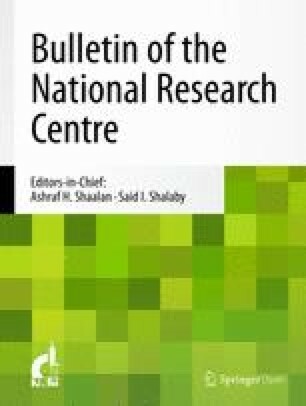 The authors acknowledge the Food Technology Department, Arid Lands Cultivation Research Institute, City of Scientific Research and Technological Applications (SRTA-City), New Borg El-Arab, Alexandria, Egypt for funding the activities presented in this study. All funding from City of Scientific Research and Technological Application. All data and material available. MGS and SAES conceived and designed the experiments. MGS carried out the experiments. MGS, MAE-S, SAES, and MMY analyzed the data and wrote the manuscript. All authors read and approved the final manuscript. All the participant researchers are consent for publication.